The most simple to implement security solution. It is both a feature-rich lockset and access control system. Install it with a screwdriver and add locksets as desired. The locksets retain an audit trail of thousands of card and device events and are automatically picked up by regular credential usage. Mobile Apps upload transactions to the software and cards pass these transactions to the software as they are presented to online readers. Electronic rekeying and other programming changes can be made to “offline” locksets through regular card usage or, more immediately, with the presentation of a mobile programming App. Unlimited Apps are allowed in a system located anywhere in the world. Simply click the “Auto Sync Doors” button. No training required. 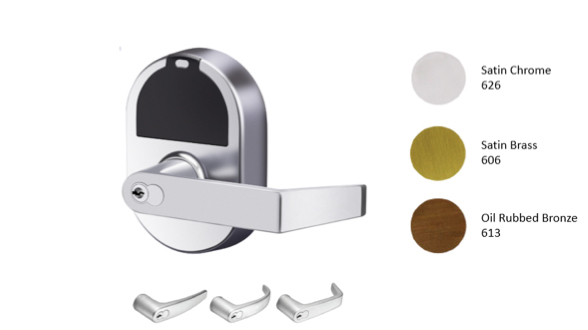 The locksets are programmable to allow access during any number of custom time periods, including Holidays. Unique to the security industry, the use of an emergency mechanical key is noted and communicated to the software as mechanical key usage. This allows for the mechanical key to be stored in a vault, providing certainty of who used it, as with any other issued electronic credential. Keys can now be strictly used as an emergency tool. 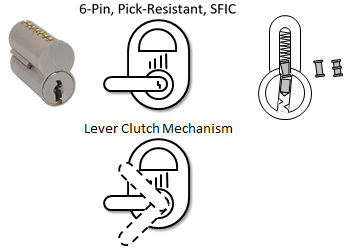 In addition to monitoring key override use, Proxess locksets come standard with 6-pin, removable cores, pick resistant segments, and a highly restriced keyway. Locks also include a vandal-resistant mechanical clutch mechanism to prevent a force override of the lever. There is no door prep or unsightly holes that need to be drilled to install a Proxess cylindrical lock. A screwdriver is all that is needed. This greatly reduces the cost and logistics for access control implementations, especially for multiple and geographically dispersed facilities. Only a single, additional ½” hole is required to install in a standard mortise installation. One part number provides application in many different environments, including upscale offices and exterior building entries. Proxess standard locks are ANSI 156.2 rated for all Indoor/Outdoor applications, including exterior doors. For added weather protection, specify “W” for IP65 equivalency, when both the exterior and interior trim is completely exposed to elements (exterior gates, etc.). A local lockdown can be manually performed inside the lock, keeping occupants safe without exposing them to dangerous events occurring on the exterior side of the door. A local Lockdown\Privacy can be configured to release by either standard egress or with a “Lockdown-Release” credential. A local Lockdown may also be activated by clicking the button on an active BLE fob. Fobs can be issued to individual users and can control one or more doors within range (100 feet maximum). The door must be in a closed position for this function to work. A local Lockdown can be configured to be released by either the free exit from inside, or with a Lockdown-Release credential. A Global\Centralized Lockdown can be initiated from the Proxess software, transmitting this command to the locksets through BLE gateways (our door controllers also include a gateway!). A local Lockdown can be configured to be released by either the free exit from inside, or with a Lockdown-Release credential from inside, or with a Lockdown-Release credential. On-demand updates and other configuration changes can be made to “online” locksets, through the deployment of BLE gateways (our door controllers also include a gateway!). Unlimited gateways can be deployed in a system located at any number of sites anywhere in the world. Bright green and red LEDs and accompanying sounds provide important visual and audio feedback to the user, including valid entries, invalid attempts, Lockdown activities and low battery indication. 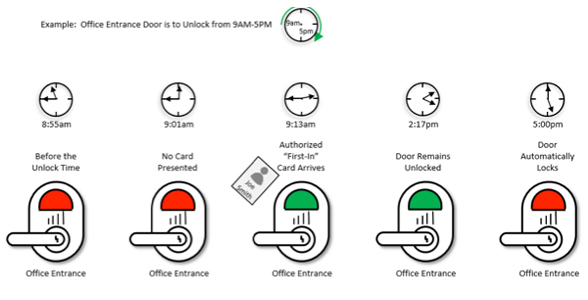 “Offline” locksets can be programmed to be unlocked during various times, such as 9AM to 5PM. However, a checkbox in the Proxess software ensures that a valid “first-in” credential is presented, before the automatic unlock will occur. Impromptu rights changes to doors can be delivered to “offline” locksets with a simple-to-use mobile App. In this manner, rights (gym, pool, clubhouse, etc.) can be restricted as an initial measure for dues non-payment, forcing the restricted user to the office to pay their fee and have their credential re-authorized. Impromptu rights changes to doors can be delivered to “offline” locksets by ensuring users go through an online or checkpoint reader, which will automatically change the rights on the appropriate user’s card. In this manner, rights can be restricted as an initial measure for dues non-payment forcing the restricted user to the office to pay their fee and have their credential re-authorized. Without any special configuration, the lockset audit trails provide the software an attendance log. A report of the list of attendees (employees, contractors, etc.) to any door or site can then be printed or downloaded. Since the access rights are stored on the card, only a credential certification handshake is required (besides an internal Blacklist check). This eliminates the need for inefficient database searches and of storage space as a limitation or need. Employing our Network-on-Card technology removes an order of magnitude of complexity from the Proxess software. This simplifies the system architecture, server, and maintenance costs and user interface, providing a purely linear scale for lockset and reader additions. The NXP Mifare DESFire EV2 smart chip is the most advanced and future-proof security technology that exists by incorporating AES128 encryption standards. Uniquely, Proxess adds a secure App and further enforces a 2-way certification handshake between the card and the reader. Our restricted EV2 format is one of only two unhacked credentials in the industry and is the smart upgrade for the vast majority of deployed cards across the world. Intelligence-on-card supports a unique communication between the software and “off-line locks”, saving up to 80% in system costs and software complexity. 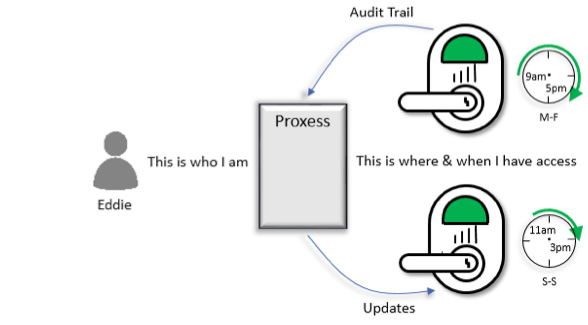 The card collects audit trails from the locksets and carries user privileges to the locksets. Created for field programming simplicity, this App takes almost no training, as the operator (Maintenance, Ops Staff, RA, IT,…) simply clicks “Sync with ACS” and then “Auto Sync Doors”. That’s all it takes for all the updates configured into the software, from perhaps many miles away, to be programmed into the locksets and for the audit trail on the locksets to simultaneously be uploaded to the software. Cards can be enrolled or deleted in the field, including at remote sites. Simply place a card on the enrollment reader, connected to our no-fault mobile app and click. 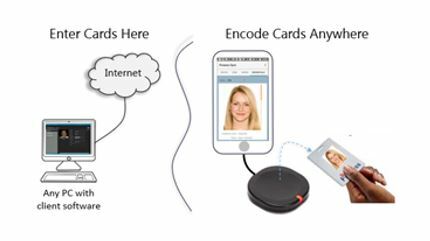 The system software can remain at a remote location and the cardholder names can either be pre-enrolled, or entered at the time of the card's remote encoding. Computer and software costs, as well as training and maintenance are greatly reduced with this Proxess tool. A single software checkbox enables the requirement for users to check in at an online door(s), where their credentials will then be reauthorized to operate at their internal offline locksets. The timing is user definable, from one day to many years. This replaces “hard” anti-passback from traditional access control systems, whose deployment and maintenance is complex, problematic and requires a lot of “resets”. The Proxess Controller represents perhaps the biggest access control panel advancement in years. Supporting two independent doors, via secure RS-485, the panel connects to the network via a PoE or PoE+ cable and also includes on-board WiFi, leveraging the customer’s wireless infrastructure. 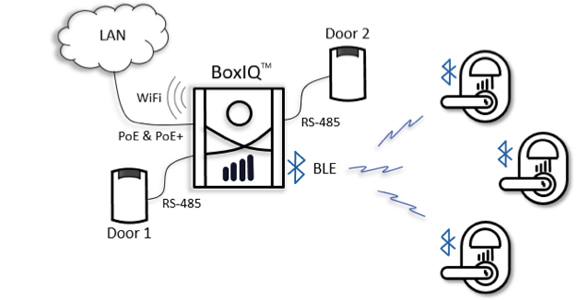 BLE (Bluetooth Low Energy) is also built in for on-demand communications to Proxess locksets and future IoT devices. ProxessIQ™ is the simplest to implement access control solution. It is as easy as installing a single lockset, yet includes the back-end of a feature-rich access control system. From anywhere in the software, place a card on the enrollment reader and an automatic pop-up window appears for you to create a new user with this card, add it to an existing user, or easily make other system choices. As a system’s size and complexity grows, ProxessIQ™ provides tools to easily put it into perspective, exhibited with our automatically generated Access Rights Wireframe. 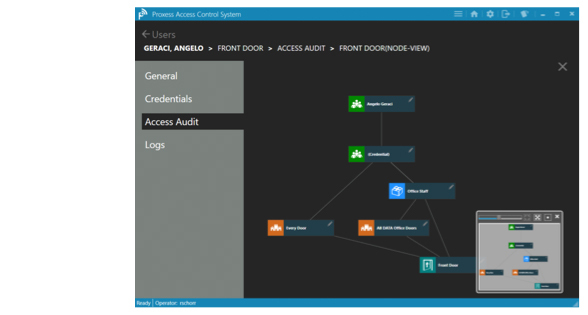 At a glance, an operator can visually inspect the relationship of a user and their credential(s) with any Access Profile they may be a member of, along with the Door Group(s) and Individual Door(s) to which they have access. 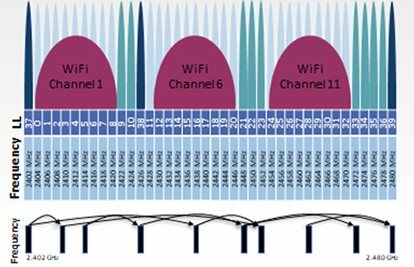 The Proxess system utilizes emerging security communication standards, leveraging open 2.4GHz channels and frequency hopping schemes, making it impervious to conventional web surfing hacks and denial-of-service attacks. BLE (Bluetooth Low Energy) uses about 3% the power of WiFi, includes built-in long range reading up to 100 feet and future proofs your investment, enabling Mobile phones as credentials. OSDP (Open Supervisory Data Protocol) is the future-proof access control standard for interoperability and 3rd party Integration. Proxess locksets and readers will utilize these standards, providing migration paths into compatible systems and safeguarding your technology investments with us. Extending real-time operations, we further provide a hardwire connectivity option to our locksets. Satin Chrome, Satin Brass and Oil Rubbed Bronze (690 or 613) are our most common finishes, but we are able to accommodate most other finishes or lever styles your facility requires.